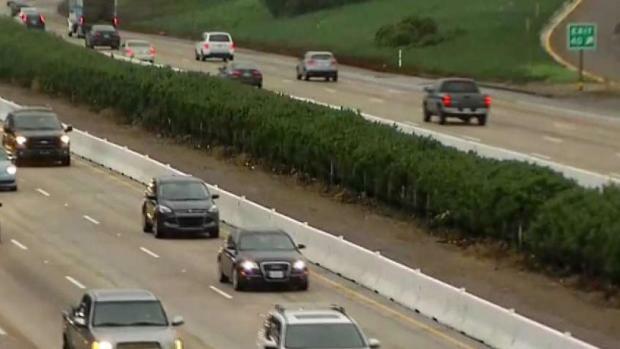 A portion of Interstate 5 will have a new speed limit for the next three years as crews continue construction on the freeway’s carpool lanes, according to San Diego Association of Governments. Interstate 5’s speed limit will be reduced from 65 miles per hour to 55 miles per hour on the eight-mile stretch from Manchester Avenue in Encinitas to Palomar Airport Road in Carlsbad. The new speed limit will take effect beginning Monday and continue through the completion of the construction, which is estimated to finish in 2022. Drivers will be alerted when they enter into this eight-mile zone and when they leave it with posted signs, according to SANDAG. Speed radar detectors will also be posted in the area to help remind drivers of their speeds. The California Highway Patrol will monitor the area during construction, where drivers could receive citations over $1,000 for speeding, driving aggressively, texting, or other forms of distracted driving. Interstate 5 will see eight weeks of construction to widen its carpool lanes. NBC 7's Joe Little is in Encinitas with more on the upgrades. The construction of new carpool lanes on I-5 is part of Build NCC, a collaborative infrastructure upgrade by SANDAG, Caltrans, and the U.S. Department of Public Transportation.